The world’s first digitally printed dress sock – all the benefits of traditional comfort without the color limitation and pixelation of a traditional knit sock. This is part of the Classic line range and is a Business Dress Sock. If you wish to order a FREE sample first - please use the coupon code “SAMPLE” at check-out and we will send you a free printed sample in your chosen combination! 2 week lead time. Please upload your logo, design so we can send you back a digital proof. If you prefer to do it yourself you can download the template in the description and re-upload the completed pdf file. Please choose your preferred packaging. The polybag is standard and is free. 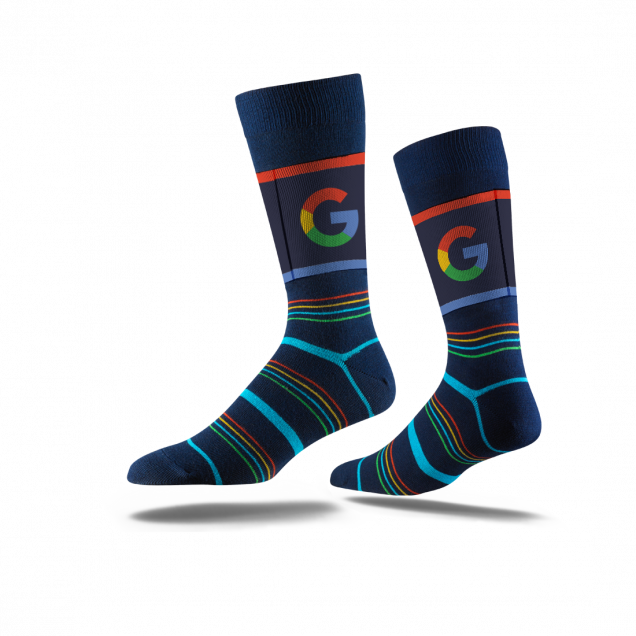 The Custom swing tag will add an extra cost per pair of socks. If you choose the Custom swing tag – Download the template here. The Business Sock is made up of 65% terry cotton, 25% micropolyester, 10% elastic/spandex. This is only available in the crew length and has a choice of 15 base colours to start from. This is the perfect sock for the corporate world with the same large design window as the Premium and Classic but with a thinner dress sock knit with corporate colours and decoration. Please fill out the form below if you want to find out more or have any questions you need answered.